Two-time U.S. chess champion Patrick Wolff is forming his own hedge fund Grand Master Capital Management LLC. Playing in the one day schedule of a Swiss tournament, I finished with a score of 3-0-1 yesterday at the Marshall Chess Club. 13.Bxf6 Bxf6 14.Qh5 Bg5 15.Rad1 Nxf5 16.g3 Nd4 17.f4 Nxb3 18.fxg5 Nd4 19.gxh6 g6 20.Qg4 Kh7 21.Ne4 Nf5 22.Rxf5 gxf5 23.Qg7#. 37.Qa2 Nxg2 38.Qxg2 Bxg2+ 39.Rxg2 Qxc3 40.Rg4 Qxb3 41.Rg3 Qd1+ 42.Kg2 Qxd4 43.Rf3 Qe4 44.Kf2 Qxf3+ 45.Kxf3 b4 46.Ke4 c5 47.Kd3 h5 48.h4 Kg7 49.Kc4 Kf6 50.Kb3 Kf5 51.Kc4 Kg4 52.Kb3 Kxh4 53.Kc4 Kg3 54.Kb3 h4, White resigns. 57.Kc7 Kg3 58.d8=Q Rxd8 59.Kxd8 h4 60.Re3+, Black resigns. 53.Bc4 e3 54.Kxe3 Ne4 55.Bxf7 Nxg3 56.Kf3 Ne4 57.Bxh5 Kb5 58.Bg6 Kxb4 59.Bxf5 Nf6 60.Bc8 Kxa5 61.Bxb7 Kb5 62.Ke3 Kxc5 63.Bxa6 Kd6 64.Bc4 Ke7 65.Kd4 Nh5 66.Ke5 Nxf4 67.Kf5 Ng2 68.h5 Ne3+ 69.Kg6 Nxc4 70.Kg7 Nd6, draw. 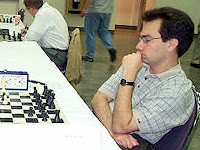 National master Jonathan Hilton and international master Dean Ippolito have collaborated on volume one of Wojo's Weapons: Winning with White [Mongoose Press, 2010, 408 pages], which is an alliterative title to their book on the late grandmaster Aleksander Wojtkiewicz's favorite Catalan Opening. 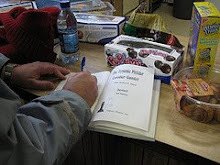 In the introduction, the reader is informed that " 'Wojo', as he was affectionately called by his fans, was arguably the most successful tournament player in the United States, winning the Grand Prix six years in a row from 1999 to 2004." 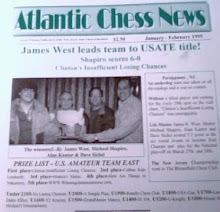 The mojo of Wojo can be found in his pragmatic approach to tournament chess, enabling him to defeat more than a thousand master-level players in the U.S. between 1998 and his death in 2006. This book is divided into four parts: Closed Catalan, Open Catalan, Slav Defense, and Black's Other Defenses. The idea behind the Catalan is quite simple: White's fianchettoed king bishop controls the long diagonal and is better than Black's queen bishop. In their recent world championship match, Viswanathan Anand used the Catalan successfully against Veselin Topalov. My experience with Wojo's Weapons has been mostly a favorable one, in that my positional play is better as a result. Needless to say, there is no resemblance between the Catalan and the Philidor Counter Gambit! The latter is extremely tactical in nature. During many years of playing the PCG, I have neglected the simple chess that is exemplified by the Catalan, especially Wojo's handling of it which avoids sharp tactical variations in favor of lines that give White slightly the better game. 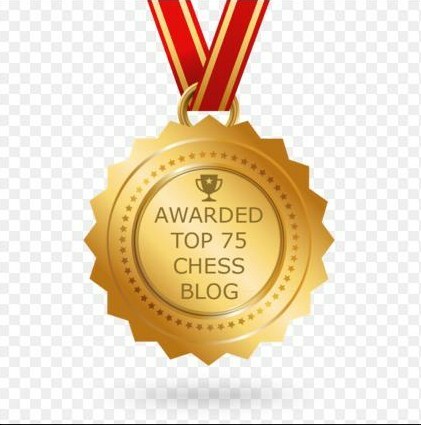 An oversight by the authors is their failure to mention that Bobby Fischer once played the Catalan, winning with it against Attilio Di Camillo at the U.S. Championship in 1957. The game would have transposed into the Chigorin variation if Fischer had allowed 3.c4 Bg4. My one criticism of Wojo's Weapons is that the in-depth analysis at times reminds me of the saying that "less is more." The reading can become tedious, at approximately the rate of five pages per hour if you study all the subvariations. I might have enjoyed the book more had there been less analysis. 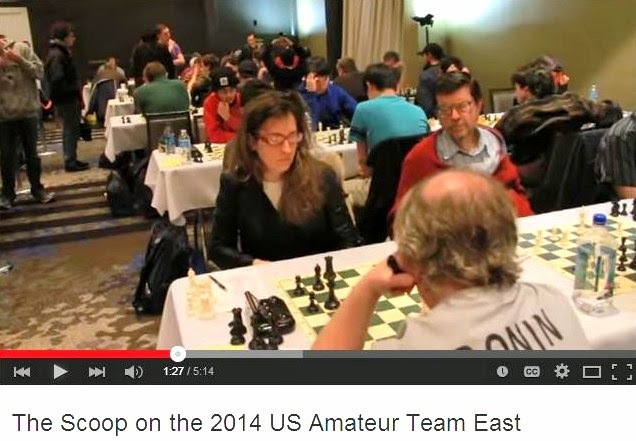 But this is a minor quibble from someone who prefers king pawn openings over queen pawn openings! In ths video, Garry Kasparov discusses chess, Russian politics, and the role of intuition in our risk averse society. Inwood Hill Park on "YouTube"
Here is a video on the NYPD's chess bust at Inwood Hill Park. Turkey is in the news on Thanksgiving Day, but not the one on your dinner table! That's the new rule for chessplaying adults at Inwood Hill Park, where the New York City parks department installed two picnic tables on Saturday. 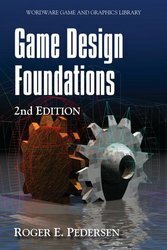 The tournament director for Sunday's grand prix tournament at Chess Mates was Roger E. Pedersen, whose T-shirt promotes the second edition of his book Game Design Foundations. On Sunday, I won this game at Chess Mates in the game/45 Swiss tournament. 21.d4 Be6 22.Bc4 Bxc4 23.Nxc4 g6 24.Bc7 a4 25.b4 Re8 26.Kf2 Kf7 27.Nd6+, Black resigns. 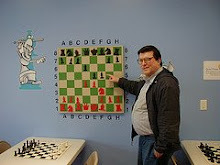 The following game was played yesterday at the Marshall Chess Club. 30.Rc1 Kb7 31.b5 Rfh7 32.Kf2 fxg3+ 33.Bxg3 Rxh2+ 34.Bxh2 Rxh2+ 35.Ke3 Rb2 36.a4 Ra2 37.Bh3 Rh2 38.Bf5 Rh8 39.Rg1 Rg8 40.Rh1 Bxh1, White resigns. On Sunday, I took these pictures during the game/45 Swiss tournament at Chess Mates. Here are two tournament directors, Zigmant Bliznikas (Rahway) and William Cohen (Westfield). Todd Jobson has White against Anthony Norris. Praveen Balakrishnan writes in his scorebook. 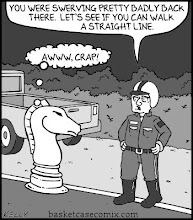 On October 20th, a squad of cops in bulletproof vests swooped into an upper Manhattan park and charged seven men with the "crime" of playing chess in an area off-limits to adults. 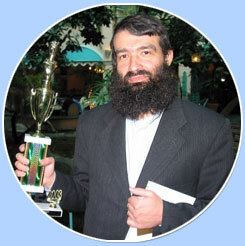 Chess lessons with grandmaster Leonid Yudasin are available Monday - Thursday at Chess Mates in Rahway. These are the fees and schedules. 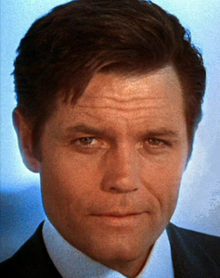 Below 1600: $15/day, $40/week, $120/month. Advanced 1600+: $15/day, $25/week, $80/month. Below 1600 (10 years old & under): Monday - Thursday, 3:15pm- 4:45pm. 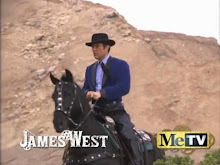 Below 1600 (11 years old & above): Monday - Thursday, 3:40pm - 6:20pm. Advanced 1600+: Monday and Thursday, 6:25pm - 7:55pm. 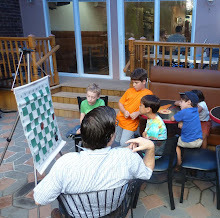 During Saturday's game/60 Swiss tournament at the Marshall Chess Club, I snapped these photos. 5-time U.S. chess champion GM Larry Evans [pictured right, with Bobby Fischer] passed away yesterday in Reno, Nevada. In this video, Peter Lalic (with FIDE rating 1951, not to be confused with FM Dragan Lalic) analyzes the Fajarowicz Variation in the Budapest Defense. Today's game/45 Swiss tournament at Chess Mates was a three-round event, ending in a tie for first place between Anthony Norris and me with identical scores of 2-0-1. 39.Rxh7 Rb3 40.Rh6+ Kf7 41.fxe4 fxe4 42.Rc6 Rb2 43.Kg4 e3 44.Kf3 e2 45.Kf2 Kg7 46.Ke1 Rc2 47.c4 Ra2 48.c5 Kh7 49.Re6 Rc2 50.c6 Kg7 51.h6+ Kh7 52.Kf2 Kh8, draw. 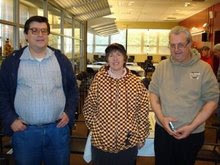 In today's game/60 Swiss tournament at the Marshall Chess Club, I finished with a score of 3-1-0. 69.Kc4 Qa5 70.Kd4 Qb5 71.Ke3 Qc4 72.Kf3 Qd4 73.Kg2 Qf4 74.Kh3 Qg5 75.Kh2 Kd2 76.Kh3 Ke2 77.Kh2 Kf2 78.Kh1 Qg2#. 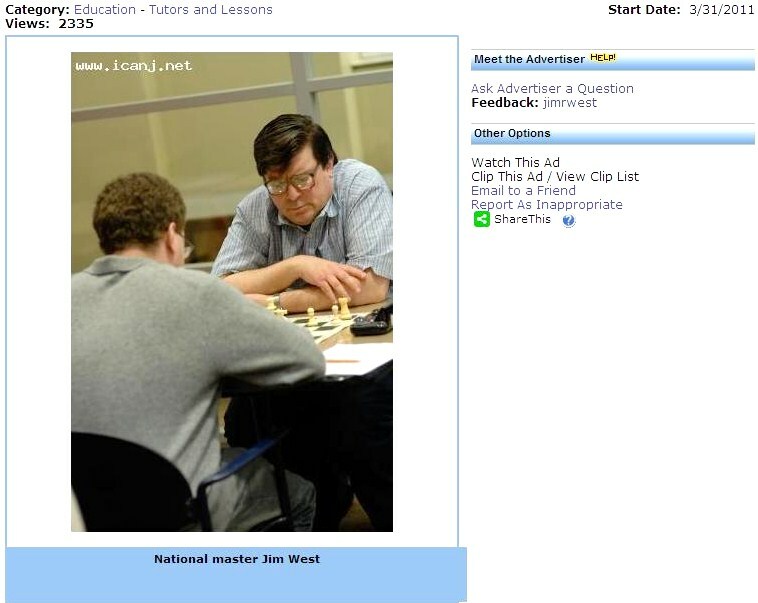 Here is a recap of the Marshall Chess Club Championship 2010 from Chess Life Online. A special investigative report has revealed that Israeli officials bent the rules to ensure that grandmaster Alik Gershon [pictured] would break the Guinness world record for simultaneous exhibitions. As a result, Guinness will review its rules for breaking the record. 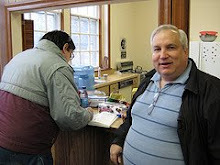 International master Dean Ippolito has postponed his world record attempt until possibly April 2011. 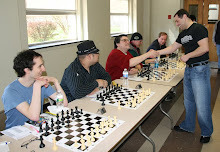 On Sunday, I took these pictures during the game/45 grand prix tournament at Chess Mates in Rahway.